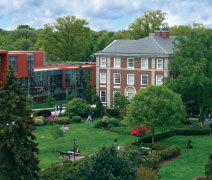 Located in Garden City, New York, Adelphi University is a nationally ranked doctoral research university offering exceptional liberal arts and sciences programs and professional training with particular strength in its Core Four: Arts and Humanities, STEM and Social Sciences, Business and Education Professions, and Health and Wellness. International Student Services: International student services and admission requirements can be found at admissions.adelphi.edu/international. Financial Aid: Merit scholarships are available based on GPA and SAT or ACT scores. We’re proud of the many accolades Adelphi has received, including being named one of “America’s Top Colleges” by Forbes 2017; named a “Best College” in the U.S. News & World Report 2017 edition; listed in “Best Colleges for Your Money” by Money magazine 2017; and voted #1 in seven categories, including Best College and Best College President, in the Bethpage Best of Long Island competition. Adelphi—which was founded in Brooklyn in 1896 and moved to Garden City, New York, in 1928—is Long Island’s oldest private coeducational university. Today Adelphi serves 5,200 undergraduate students at its beautiful main campus in Garden City—just 37 kilometers from New York City’s cultural and internship opportunities—and at dynamic learning sites in Manhattan, the Hudson Valley, and Suffolk County. Our beautifully landscaped 30-hectare Garden City campus, a registered arboretum, is another attraction—offering both a peaceful atmosphere for relaxing or catching up on your studies and an energetic university life. You can take classes in up-to-date facilities such as our new 100,000-sq. ft. Nexus Building, home to the College of Nursing and Public Health. More than 1,300 students are finding their home away from home in Adelphi’s seven residence halls—the newest added in 2011. Both the Center for Recreation and Sports and the Performing Arts Center opened in 2008. And from day one, you’ll be part of our powerful network of successful Panther alumni. Networking programs and events held throughout the year can help you land a job before you graduate. It’s no wonder 96% of our students are either employed or in graduate school within one year of graduation. Adelphi is big enough to give you choices yet small enough to feel like home. We’ve welcomed our largest and most diverse first-year classes in the past two years, numbering 1,200—attracted by our reputation, increasing number of awards and accolades, wide array of 50+ programs of study, dedicated faculty, average of 21 students per class, and 10:1 student-faculty ratio. Adelphi is making the diversity of its students and faculty a priority with the recent formation of the Office of Diversity and Inclusion. You can be part of that inclusive environment and a student body from 46 states and 57 countries. Whether your passion is dance, biochemistry, or international relations, you’ll find it here. We offer a wide array of undergraduate programs of study, so you’re sure to find what you’re looking for. You might visit a dinosaur dig, learn about trading on the stock exchange in New York City, or pursue environmental studies on a study abroad trip to Australia—whatever fits you and your interests best. Globally recognized scholars, artists, and researchers fill the ranks of accessible faculty members at Adelphi—totaling more than 1,000 full- and part-time professors. Our faculty members are Guggenheim Fellows and Fulbright Scholars. They win grants from the National Endowment for the Arts and the National Institutes of Health. They are sought-after speakers at conferences worldwide. At Adelphi, faculty support extends beyond the classroom, with professors dedicated to giving you the advice and answers you need. You’ll be encouraged to pursue original research, collaborate with peers and mentors, and take advantage of hands-on learning experiences. Adelphi offers a vibrant campus life, and getting involved is something our students are eager to do. Run for student government, play in the orchestra, or participate in any of our other 80+ student clubs and organizations. Or join one of our 23 Division II teams or play intramural sports. We also offer a full calendar of art exhibitions, theater, music, and dance as well as lectures. Adelphi has a strong commitment to international education. The Office of International Student Services assists in meeting legal requirements for entry into the United States and maintaining legal status while studying at the University. The office provides advice regarding requirements of US Citizenship and Immigration Services, the US Social Security Administration, and the Internal Revenue Service. Information and advice are also offered concerning differences in government laws and regulations, language, customs, culture, and educational systems. For some international students, the move from high school or university in your home country to a degree program in the United States can be challenging—a new language, new ways of learning, and a new home. The Undergraduate and Graduate Accelerator Programs ease this transition by combining credit-bearing courses with additional academic support, language instruction, and cultural experiences. Together, these facets of the program combine to create a learning-centered environment that promotes academic success, active involvement in campus life, and community engagement.